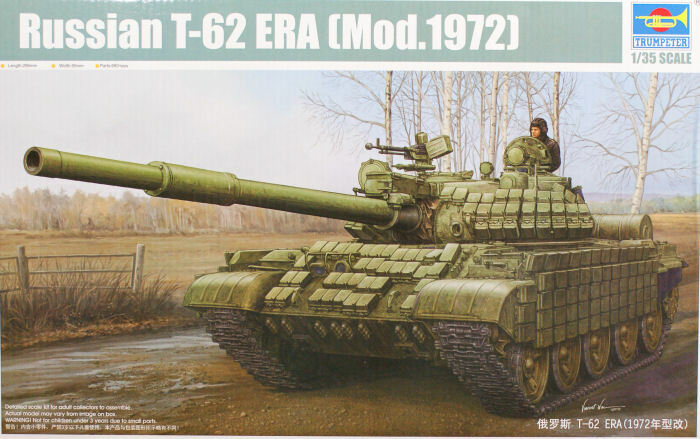 The T-62 was an evolutionary improvement over the T-55 with a new main gun designed to counter new western threats such as the M60, Chieftain, and Leopard. Other incremental improvements were also added to the vehicle though the design still shared many parts with the older T-55. Even though the T-62 faced some operational setbacks, most notably being 'plinked' in large numbers by up-gunned Israeli Sherman tanks defending the Golan Heights during the initial hours of the Yom Kippur War and then being driven back by the very same M60s and Chieftains that the T-62 was designed to counter. Nevertheless, the T-62 remains operational in a number of armies around the world despite newer tanks like the T-72, T-80, and T-90 being available. If you look at the production history of this tank in Wikipedia, you'll see how the Soviets and later the Russians have incrementally improved the T-62 to keep it operationally effective as threats continue to evolve. When Trumpeter released their first T-62 kit nearly three years ago, they easily defeated any other T-62 kit for the title of best T-62 in any scale. Since that first release, Trumpeter has offered parts variations to render some of the unique configurations of the tank, and this is one of the more unique examples. This is the Object 166M configuration of the T-62 series which took the Model 1975 configuration and added the distinctive ERA applique armor horseshoe around the turret, glacis plate, side skirts, etc. Designated T-62M (Model 1972), the tank also received T-72 tracks, armor plate under the driver compartment to protect against mines, the 9K116 Sheksna (AT-10 Stabber) guided missile that fires through the main gun, new radios, new V-55U diesel engine, and smoke canister launchers on one side of the turret. This kit updates the earlier kits with all of these new details. More importantly, the tooling also corrects the angle of the engine deck, an error that Cookie Sewell pointed out here. Trumpeter does listen to its customers and adjusts accordingly! Molded in light gray styrene, the kit is presented on 23 parts trees plus the lower hull and turret, one tree of clear parts for the periscopes and lenses, four trees of black vinyl (rubber) parts, two frets of photo-etched parts, and one turned aluminum main gun barrel. As with many of the kits in this series, the T-62 doesn't have an interior, so if you do pose the kits with the hatches open, you'll want to have crew figures perched in those hatch openings. While I'm sure Trumpeter could have engineered this kit with interior details, you can also be sure that the retail price would have been much higher. With a street price around $44.00 USD, those of you that want to have some details inside the turret and hull might be able to find and adapt some aftermarket options produced for the venerable Tamiya kit. As usual, Trumpeter produces some amazing kits and what is particularly amazing about this kit is the fact that Trumpeter corrected the slope of that engine deck based on feedback from their original T-62 release. This kit is easily the best T-62 kit available in any scale and will be a nice addition to your armor line-up.